Our Global Affairs Canada funded Indonesia programme aims to improve incomes, health, and the environment of the vulnerable and marginalized men and women dependent on the artisanal and small-scale gold mining (ASGM) economy in targeted areas in Indonesia. Through the Sustainable Development of Artisanal and Small-scale Gold Mining in Indonesia project, or “Program Emas Rakyat Sejahtera (PERS) as it is called in Bahasa Indonesia, AGC is aiming to enhance the environmental and socio-economic well-being of artisanal gold mining communities in Indonesia. There are 3 targeted project areas for this program. AGC Indonesia, through its local affiliate Yayasan Emas Artisanal Indonesia, has implemented the program in 3 areas; Parenggean (Central Kalimantan), Tatelu (North Sulawesi) and Tobongon (North Sulawesi). 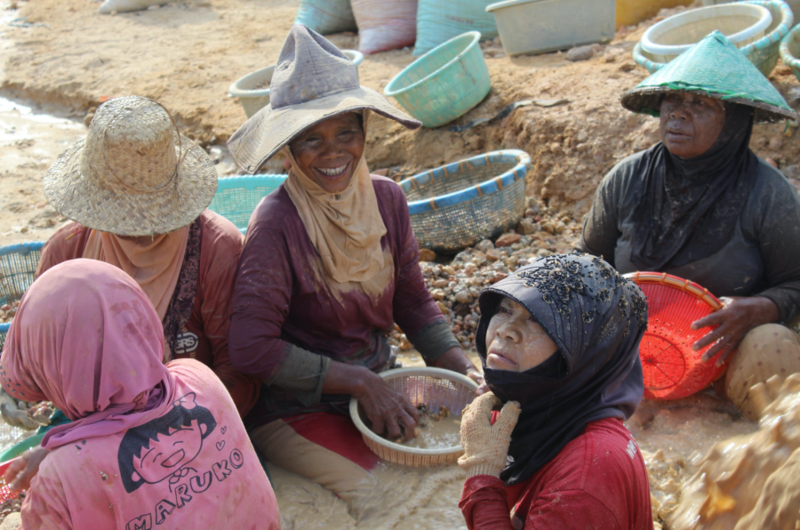 With the objective to create an equitable and sustainable development of artisanal mining communities in Indonesia, the duration of this program is 2015 – 2020. AGC also works together with strategic partners from the government of Indonesia such as Coordinating Ministry of Economic, Ministry of Environment and Forestry, and the Ministry of Energy and Mineral Resources. Besides, AGC also collaborates with local partners AMAN in North Sulawesi, Lentera Kartini in Central Kalimantan and others. The program is expected to have the following results: (1) Improved environment, health and better social practices adopted and implemented by men and women gold miners and service providers in targeted areas; (2) Improved ASGM policy and technical environment in targeted provinces; (3) Increased participation of private sector and civil society in a responsible and legal ASGM sector. This initiative supports the Government of Indonesia’s implementation of the Minamata Convention on Mercury, its National Development Plan and Master Plan for Economic Development (2011 – 2025), and the principles of the 17 Sustainable Development Goals. Go to the PERS website for more information. As the artisanal and small-scale gold mining (ASGM) sector is a major source of mercury release and environmental pollution in the world, the Minamata Convention requires countries which determine that ASGM activities are more than insignificant in their territory to develop a national action plan (NAP) to reduce, and where feasible, eliminate the use of mercury and mercury compounds within three years of the treaty entering into force. Within each country the AGC will develop a national analysis of the ASGM sector, including a baseline inventory of mercury use and mining practices. The analysis will provide the basis for identifying national objectives, as well as setting targets and strategies to eliminate worst practices and facilitate the formalization of the sector. The intent of working on each NAP is also to improve the health of the miners and ASGM communities by developing a public health strategy for the sector. The strategy will be based on the health situation and institutional capacity needs assessments that will be conducted by the AGC. Awareness will be raised on the risks of mercury use and also on the development of the NAP among relevant stakeholders. To conclude, the AGC will support these governments to endorse their NAPs, define schedules for their implementation and officially submit them to the Minamata Convention Secretariat. Partners for this project are: United Nations Environment and the Global Environment Facility (GEF). In the Phillipines and Mongolia the AGC is working to bring positive changes to the countrys’ artisanal gold sector in innovative ways. The project will help the countries to significantly reduce mercury use in ASGM mining and improve the lives of miners, in part by developing responsible gold value chains that provide better incomes and opportunities to miners while incentivizing responsible ASGM production. Working with our local and international partners, the AGC will help to develop new financial tools that will allow miners to sell gold more directly to the domestic and international market while capturing a greater share of the value of the gold they produce. Increased revenues and state financing programs will allow miners to reinvest some of their profits in their operations and their communities to achieve positive social and environmental change. At the same time, the project will help to improve and where necessary, develop policy tools and local capacities to manage mercury use and steer the sector towards greater responsible gold production. Finally, we will build on the past success of our pilot mercury-free processing system in Zopal by developing new programs to train miners in mercury-free techniques and supporting the replication of mercury-free systems across the country. Currently in the project design phase, this project is expected to begin in 2018. Partners for this Project are: Global Environment Facility (GEF), United Nations Environment, and United Nations Industrial Development Organization (UNIDO). The Artisanal Gold Council visited the Philippines on three separate occasions to make improvements to the level of knowledge and awareness of the country’s ASGM sector and in assistance in developing a robust National Strategic Plan. There are approximately 300,000 artisanal gold miners in the Philippines, which directly supports over 1 million people. In addition, the Artisanal Gold Council along with UNEP and GMP facilitated the first Global Forum on Artisanal and Small-scale Gold Mining in December 2010 in Manila. The Global Forum was attended by approximately 100 participants from 17 national governments, as well as representatives from intergovernmental organizations and nongovernmental organizations. It explored policy, legal, technical and financial considerations of AGSM and in particular to how countries will be affected by the ongoing intergovernmental negotiating committee (INC) process to develop a legally binding instrument to address mercury. Partners: United Nations Environmental Program (UNEP), Strategic Approach to International Chemicals Management (SAICM), Global Mercury Partnership (GMP).